Enjoy savasana fully with our Small Cotton Eye Pillow, filled with natural organic flax seeds. Our eye pillows are made from 100% pure cotton (or choose silk). Choose from several serene colors. Our eye pillows have removable covers that can easily be washed to increase the life of your pillow, or to change the amount of filling. Available in two sizes, either silk or cotton, and filled with natural flax seeds, you'll find that the soft shape contours to your face with gentle pressure while blocking out the harsh light. 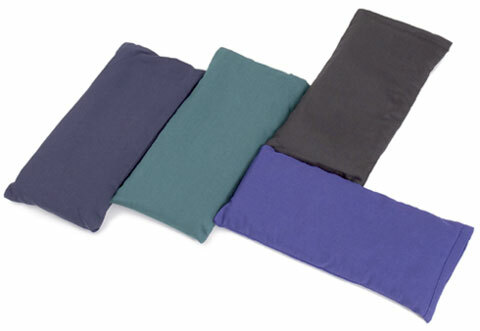 Perfect for deep relaxation and meditation, eye pillows can also be used for headache relief. My yoga students and I are so pleased with the eye pillows. The size is perfect and good quality material. Works perfect for the relaxation portion of class. They will also be used when traveling on a airplane and at home for headaches. Love that covers can be washed. I plan on ordering more as other students see them and want them too. The flax seeds really form right to your face which is so comfortable. So many eye pillows are made with scents which most people like, but I don''t. This pillow has no scent at all.